LVM was awarded Overall Championship trophy for outstanding performance in Zonal sports and Cultural Activities under Zone VII, District North, Directorate of Education. In 2017-2018, we won in Boys category, in 2016-2017, we bagged the trophy in both Boys and Girls Category while in 2014-2015 we secured the award for Boys Category. LVM was presented with SILVER CLUB Certificate by VIGYAN PRASAR, an Autonomous Organisation of Deptt. Of Science and Technology. 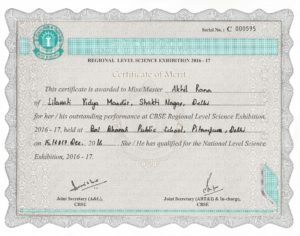 The certificate was in recognition of outstanding performance in the calendar year 2016. Proudly, the school club has now been upgraded ‘’GOLD CATEGORY CLUB;;. By VIGYAN PRASAR. The Award Winning School Gardens are a hot favourite with Judges at the Annual Flower Competition under University of Delhi. Each year the school has been winning coveted trophies and positions for Best School Lawns, Best Maintained Green Area of a Senior Secondary School and Best School Garden. In order to promote Legal Awareness among students and sensitizing them about various legal issues, Central DLSA, Tis Hazari Courts has opened Legal Literacy Club in LVM. LVM has been selected by Niti Aayog to open ATAL TINKERING LAB, one of the pet projects of Govt. of India in the field of education, for which grants have been received and lab work is in full swing. CENTRE For SCIENCE AND ENVIRONMENT has started GREEN SCHOOLS PROGRAMME under which LVM has been rated in YELLOW CATEGORY. TATA POWER SOLAR dedicated 101 KW Rooftop Solar Plant to LVM thereby making it a SOLAR POWERED GREEN SCHOOL. Indian Institute of Ecology and Environment appreciated the outstanding contribution of LVM in the area of Environmental Education and Development. In the 33rd World Environment Congress the school was conferred Eco Friendly School of the Year Award. Engineering Watch School Summit 2013 shortlisted LVM amongst top 20 schools of the country for Furthering Value Centricity, Future Readiness and Excellence in STEM Education. 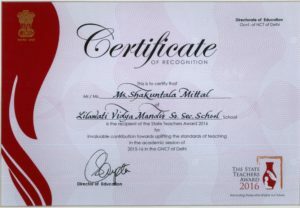 Principal Mrs. S. Khurana received the prestigious Delhi State Award for Teachers in the year 2013. Mrs. S. Mittal too followed her footsteps and bagged the same award in the year 2016. Mr. Amit, the renowned artist and LVM`s fav Art teacher, has held the lamp of school`s glory high as he has been conferred with the much coveted National Award by the Hon`ble President of India in the year 2018. LVM Judo Coach Kamaljit Kaur won Bronze Medal in Common Wealth Judo Championships 2018 in GRAND MASTERS SECTION. Another feather in LVM cap is a gold in Master’s National Games (Athletics) won by Mrs. Renu Kataria. Sahil Shah was ranked amongst the top 150 in the Prestigious Junior Science Talent Search Examination held in January 2017. 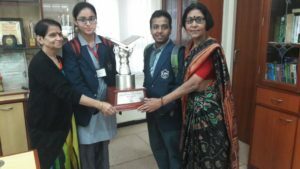 LVM was the winner of the Ramjas Debate 2017 (Hindi) organised by Ramjas School, Pusa Road. 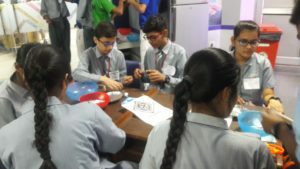 The Competition is held at two levels wherein more than 50 Public Schools of Delhi and NCR participate. Our Creative Artist Chaitanya of XII-B won the Art Competition for Senior Artists organised by Delhi Technological University. Harshit Mehra of Class IX stood II amongst 150 competitors in Inter School Painting Competition organised by HT PACE. 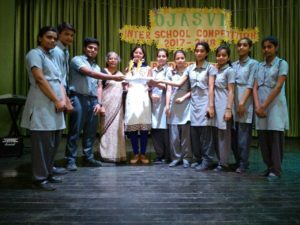 Lilawati Vidya Mandir bagged II Runner up School trophy in a medley of competitions organised by Gyan Mandir Public School. Lilawatiites were I in two events, II in four and III in two competitions. 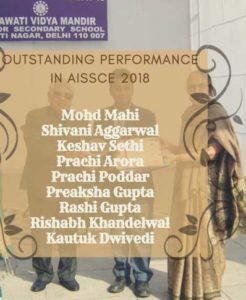 Sagar Kashyap received a merit certificate for outstanding Academic performance and for being among the top 0.1% of successful candidates in CHEMISTRY in AISSCE 2017. 16 Students received a merit Certificate for outstanding performance and for obtaining Grade ‘A’ in all the five subjects . Our student of class XI stood I and II respectively in CBSE Central Zone Skating Championship 2017-18 in two different categories. Our student of Class XII won the XIII Smt. Krishna Pathak Memorial Inter School Painting and Craft Competition organised by MM Public School, Pitampura. In I Open Delhi State Judo Championship for women, our student of class VIII stood III. Merit Positions were held by two students in Science Open Merit Test organised by Delhi State Science Teachers Forum. Lilawati Vidya Mandir celebrated Rashtriya Ekta Diwas on 31st Oct 18 to commemorate the birth anniversary of Sardar Vallabhbhai Patel. 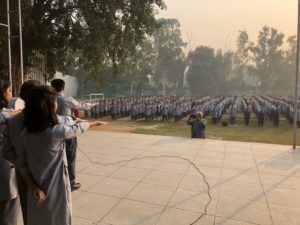 The learners of classes IX and XI participated in the Unity Run. Learners of classes VIII-XII also earnestly took an Oath and resolved to preserve the unity, integrity and security of the nation and follow the vision and actions of Sardar Vallabhbhai Patel. A paragraph on the contribution of Sardar Vallabhbhai Patel for National unity was also circulated among class V learners. The enthusiastic participation of the learners was extremely encouraging. On the special occasion of Mahatma Gandhi’s 150th Birth Anniversary, LVM organised a Special Morning Assembly. It was also the Birth Anniversary of India’s Former PM Lal Bahadur Shastri. Vanshika of Class IX anchored the assembly and quoted Gandhian thoughts. 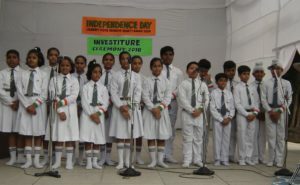 Bapu’s favourite bhajan ‘Vaishanav Jan Te..’ was sung by the school choir group. Prashansa of class X recited a remarkable self composed poem on “Gandhi Path Pradhashak” The audience was left spell bound by a short skit on cleanliness and importance of Patriotism wherein Gandhian strategy to win over hearts was also highlighted. The School Head Boy Vaibhav Chopra and Prefect Maunshree Dutta administered National Pledge and Pledge for Non Violence and Peace. Apart from this, the Legal Literacy Club organised a poster making competition on the title ‘Gandhi and his Ideals’. ‘Shramdaan’ was done by several students. To realise the goal of Germ Free India ‘Swachh Vidyalaya’ campaign continued with Handwash Day, Dusting of classes and proper use of dustbins. 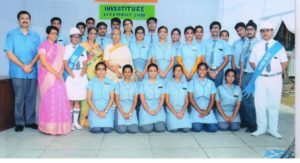 Investiture Ceremony for the Prefects of the newly inducted Prefectorial Board was held on 14th August. 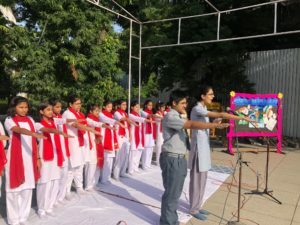 School Principal Sushma Khurana administered oath. The Prefects received their badges from the Management. Head Boy Vaibhav Chopra and Head Girl Rishita Goel wore their badges with white caps, white gloves and a sash. A total of 24 students from all the sections of class XII proudly took up the responsibility of being Prefects and pledged to impart their duties with zeal and devotion. 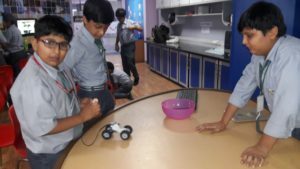 Students from all the classes showed active participation and enhanced their scientific skills by the means of “Hands on activities” dealing with the ideas of Innovative Science. 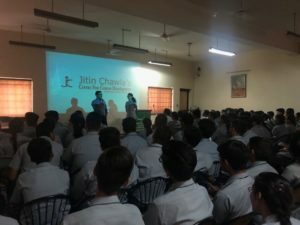 A Career Counselling workshop was organised at Lilawati Vidya Mandir Sr. Sec. School, Shakti Nagar on 17th July for students of class XII. 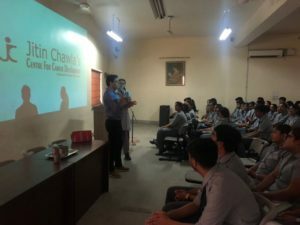 Well known Career Counsellor Jitin Chawla talked to students for more than 3 hours. All streams and subjects for careers were addressed. Students received several important tips for cracking entrance exams. Requirements for Foreign Universities were also taken up. Myriad Vocations and courses for students with creative bent of mind and out-of-box thinking were taken up. 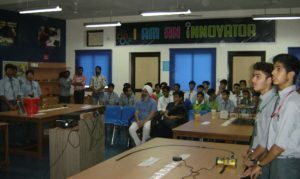 There was a Query Session as well. 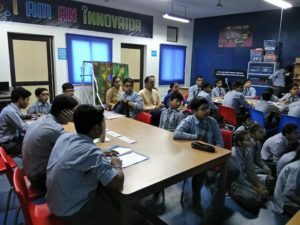 Children remarked that it was a very informative workshop which added to their knowhow of admissions and entrance exams after school. It has been a long journey yet gratifying for Chiranshu Jain of Lilawati Vidya Mandir Sr. Sec. School, Shakti Nagar, fondly known as ‘’Golden Judoka’’. With more than 30 medals in his kitty and still counting, Chiranshu now dreams big. Having won at International level has only added to his confidence. ‘’I played at three levels to reach the finals, winning the match against players from Srilanka, Myanmar, Bhutan was easy but the final round against Nepalese boy was a tough fight’’. 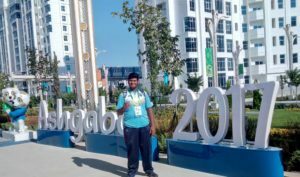 Chiranshu won gold at South Asian Rural Games 2016-2017. ‘’But the most memorable experience was at Ashgabat, Turkmenistan. What an exposure to the International world of Games! !’’ In V Asian Indoor and Martial Arts Games 2017 at Turkmenistan, the Judoka was defeated by an Iranian, 8 years older and much more heavier. But the lesson was well learnt-no shortcuts to success. His resolve to prepare for more has only strengthened. His role model is certainly his mother Kamaljeet who also doubled up as his Judo Coach and P.E.T at school. It was she who pushed him into Judo . He has played and won in Delhi State Judo Championship Six times. 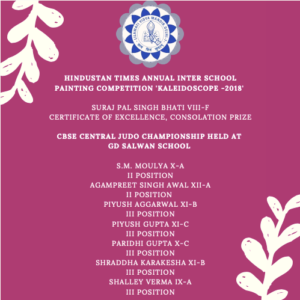 Others like CBSE North Zone Judo Championship and CBSE Central Zone Judo Championship have also been played and won. The moment of pride was to be the flag bearer of Delhi State in 63rd National School Games at Reva, Madhya Pradesh. His training sessions are getting more rigorous and demanding at Palam Judo Club where a National Coach is helping Chiranshu learn more tricks. Running, stretching, fitness, practice sessions have now become the order of the day. After all Cadet Asian Games 2018 to be held in August at Jakarta, Indonesia is not too for away. Ultimately though, Chiranshu wants to win a medal in Olympics, ‘’for my mother, the mentor’’. 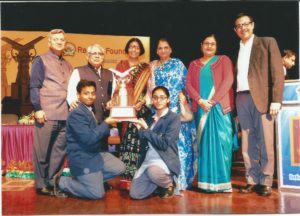 Heavyweight Orator Champions of Llilawati Vidya Mandir, Shakti Nagar lifted up the prestigious Running Trophy of Ramjas Debate Competition in Hindi . Held every year in the months of November-December, the competition witnesses more than 50 reputed schools of Delhi and NCR vie hard for the trophy. This year, our students Yash Mittal of class XII and Arunima Mehta of class X delivered an impressive performance held at Ramjas, Pusa Road. The topic for the preliminary level was “Bhakti Vyapaar Nahin”.Both of them convincingly settled the questions of interjection as well .The students and their mentor Shakuntala Mittal were delighted to enter the Final Rounds to be held at NDMC Convention Centre on December 1,2017.Now began the back breaking task of preparations. 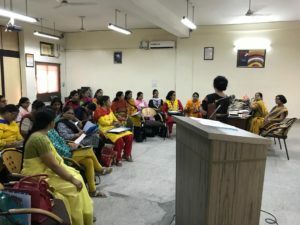 Yash Mittal and Arunima Mehta left no stone unturned to prepare their scripts and answers for the questions of interjections .In fact, teachers of the language department joined hands together for the D-Day. 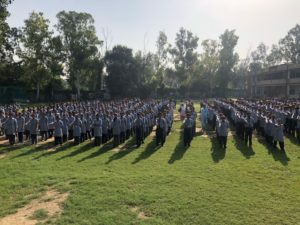 Endless drills, mock rehearsals with the Principal as well as a brain storming session for the topic “Jhadon Se Bikhar Ke Hum Tuet Jayege”marked the days. With a strong conviction, confidence and a soft prayer the team was the first to reach the venue. Their precise answers to the questions on interjection received loud applause. The performance indeed won the hearts of the audience. Proud Principal S. Khurana congratulated the winners. Social Research Centre of IFUNA designates our school Principal Smt. 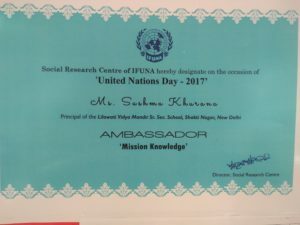 SUSHMA KHURANA as Ambassador “MISSION KNOWLEDGE” on the occasion of United Nations Day 2017. Our Olympic aspirant in the upcoming Water Sport CANOE POLO is all upbeat about her feats in the year 2017.Having participated in five National Level Sports -2017 in events like Cricket, Dragon Boat, C2, Canoe Polo and C4, she excitedly talks about her selection in World Games 2018 to be held in Russia. 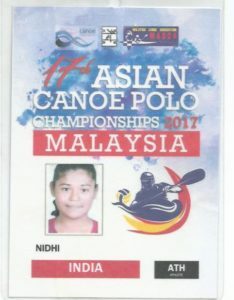 This year Nidhi bagged the Numero Uno titles in Dragon Boat event in VI National Dragon Boat and traditional Boat Racing Championship (2017) and in Canoe Polo in V National Canoe Polo Championship 2017.Nidhi gave a very impressive performance in Canoe Polo in the XVII Asian Canoe Polo Championship 2017 held in Malaysia in the second week of November. But was this sport always her calling? “Certainly Not. I started my sports career at the age of ten in 2011 when I won athletic events at Zonal levels. My mentor and school Sports Coach Renu Kataria found natural talent in me”. In the years 2013 & 2014 she even bagged the Best Athletic title hitting gold in three different events in the calendar year. The going looked good but destiny had something else in store for her. Nidhi was diagnosed with hamstring muscle strain which eventually forced her to quit athletics. Though heartbroken, Nidhi still refused to quit completely. For a few months thereafter she joined Cricket and was even the Delhi State Vice Captain during the 62nd National School Games 2016-17 organised by SGFI in Jammu. Over the course of time, officials at Indira Gandhi National Stadium helped her realize that her forte lies in her arm muscle power, strength and flexibility .Hence her sport instead should be Canoe Polo. Having found her calling, Nidhi is now focusing on it single mindedly. Her day begins at 3: 30 a.m. with two hours of road running followed by muscle training. “Carbs before workout and proteins after”-She sticks to all mantras religiously. After School and studies she heads straight to Indira Gandhi Stadium for a six hour practice session. “My father is the wind beneath my wings”, she says candidly. Her day’s regimen is professionally counseled by a team of trainers, dieticians and physiotherapists. Reaching the International arena wasn’t easy, but Nidhi won’t be deterred now. “Of course, I am working hard for the World Games. God willing, Olympics will be my next target. “Amen. 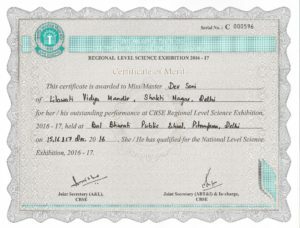 Dev Soni (X) and Akhil Rana (X) qualified for CBSE National Level Science Exhibition-2017. They received Certificate of Merit for Outstanding performance at Regional Level. 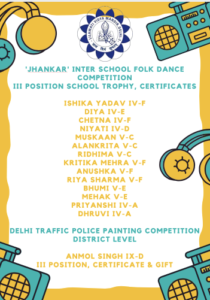 12 Folk Dancers and 10 artists of LVM win I position respectively in INTER SCHOOL FOLK DANCE COMPETITION AND NUKKAD NATAK held at Queen Mary’s School, Tis Hazari in July 2017. Meritorious Students of Science Open Merit Test 2017 organised by Delhi State Science Teachers Forum. VAIBHAV CHOPRA( XI ) stood III ; YASH KAUSHIK ( XI ) won Individual Trophy in “BATTLE OF THE BRAINS” Quiz Competition organised by KIIT WORLD SCHOOL, Pitampura. Meritorious students of XXXIII Manavsthali All India Inter School Maths Talent Test 2017. In ‘Kalakriti Art’ Competition for senior Artists organised by DTU (SAE) Chaitanya of Class XII stood I. Our troupe of 14 artists received the Certificate of Appreciation in Street Theatre festival organised by Srijan School. 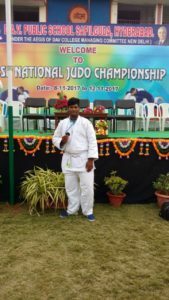 In CBSE National Judo Championship 2017-2018 , Chiranshu Jain of class XII won the bronze medal. 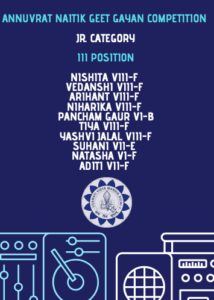 LVM won the below mentioned positions in ‘Saturnalia’ organised by St. Margaret School. 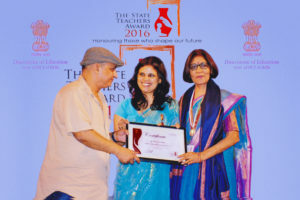 Mrs. Shakuntala Mittal (T.G.T, Hindi) from Lilawati Vidya Mandir , Shakti Nagar was honoured with the prestigious State Teacher’s Award in a ceremony held at Thyagraj Stadium on 5th September 2016. Hon’ble Deputy Chief Minister of Delhi, Mr. Manish Sisodia, Education Minister Mr. Punya S. Shriwastava, renowned actor Mr. Piyush Mishra and many other eminent personalities graced the occasion. The award was a tribute for her incessant efforts in the field of education. 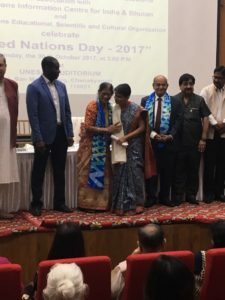 Mrs. Mittal the proud recipient of the award has proved her mettle as a dedicated Hindi teacher with an array of achievements. She is an adept story teller, whose stories have won accolades at National level and is also an avid social worker. The ‘woman of substance’ has honed many budding orators, and has given a hundred percent result for past three decades. The School Management, Principal and Staff laud the sincere efforts of this teacher, who has also won Hindi Shikshak Samman (2008) and Kartawya Sheel Shikshak Samman (2015, 2014, 2013, 2005).